C eanothus velutinus Douglas ex Hook. Names: Ceanothus is a Greek name for a spiny shrub. Velutinus means soft and velvety, referring to short, dense, silky hairs on the undersides of the leaves. This feature is more pronounced on shrubs found in drier areas east of the Cascades. When in bloom, it is covered with clusters of tiny white flowers, hence the name “Snowbrush.” It is also commonly known as Tobacco Brush or Red Root; other common names: Cinnamon Brush, Sticky Laurel, Shiny-leaf Ceanothus, and Mountain Balm allude to its sticky, scented leaves. Although it is also sometimes called Deerbrush, that name is more often applied to the related species, C. integerrimus (discussed in the section on deciduous shrubs). 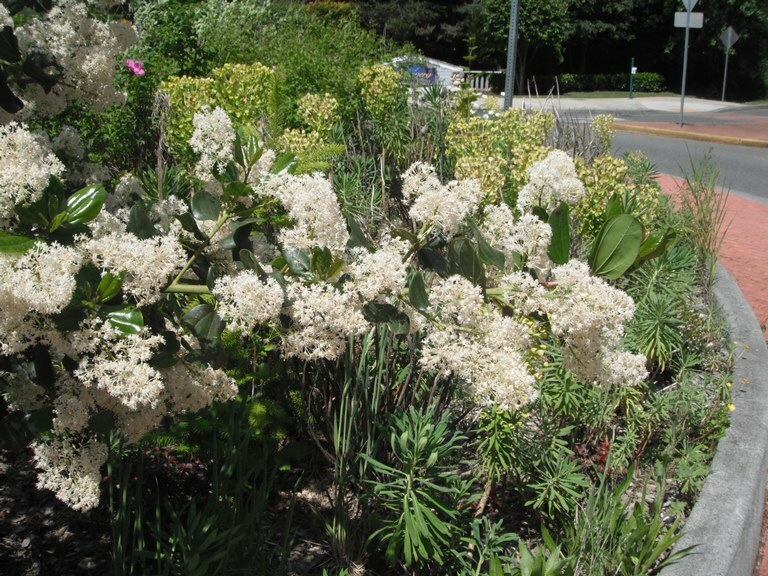 Relationships: The genus Ceanothus consists of about 60 shrubs or small trees found only in North America with about 40 occurring only in California. 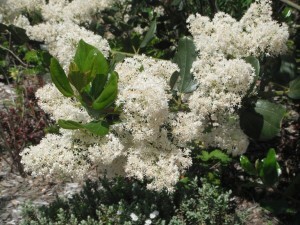 Many have blue or purple flowers, earning the genus the common name, “Wild Lilacs,” but our creamy white-flowered northwestern species are generally called “Buckbrushes.” (Redstem Ceanothus , C. sanguineus, and Deerbrush, C. integerrimus, will be discussed in the deciduous shrub section.) 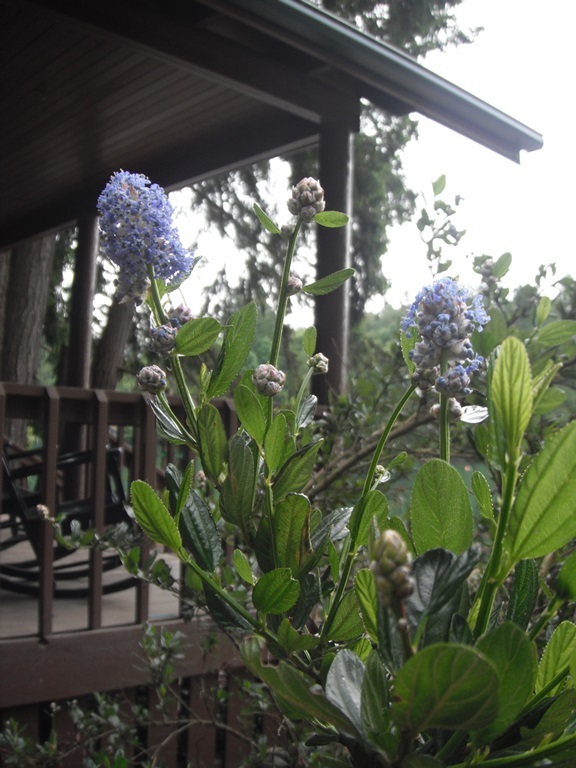 Blueblossom, C. thyrsiflorus,, one of the tallest and hardiest Ceanothus sp., which is native to southwestern Oregon and the California coast, is often planted in northwest landscapes. Distribution of Deerbrush from USDA Plants Database. 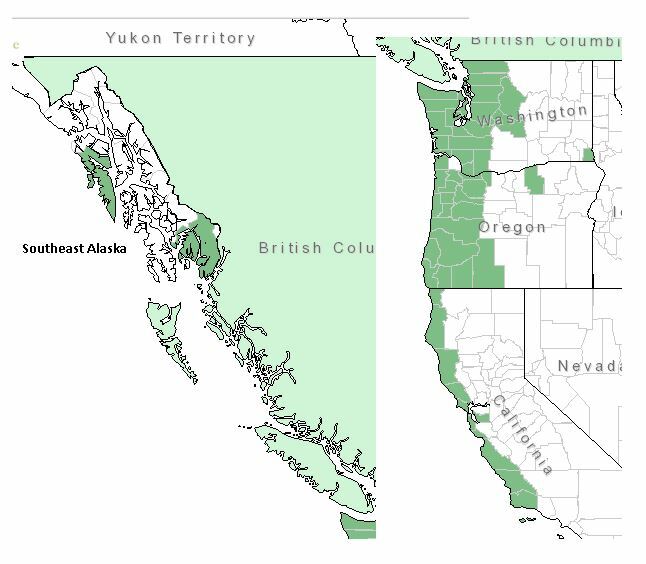 Distribution: Snowbrush is found from British Columbia and Alberta south to California and east to South Dakota and Colorado. Growth: Snowbrush grows to about 9 feet (3m) tall. It sometimes sprawls as it competes for sunlight, growing best in full sun. Diagnostic Characters: Snowbrush is easy to identify by its shiny, often sticky, evergreen leaves with 3 main veins. 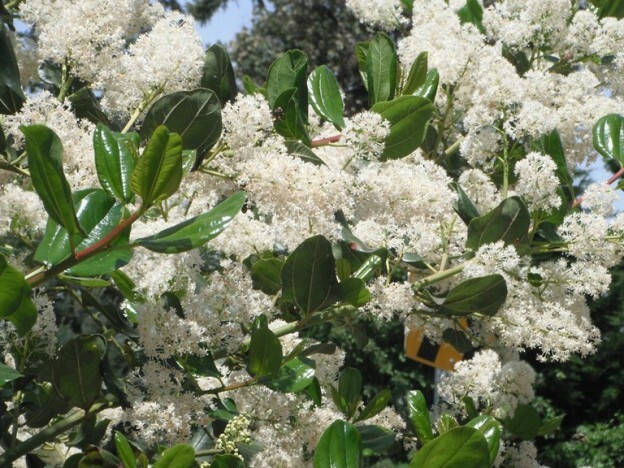 Its small, creamy white flowers are borne in pyramidal clusters. 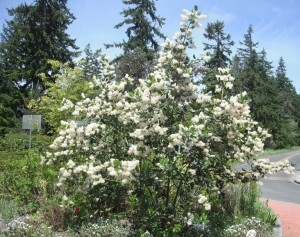 In the Landscape: Snowbrush is an attractive evergreen shrub in the landscape for dry areas. It also is able to fix nitrogen, so is useful on restoration sites. Phenology: Bloom Period: May -June. Seedpods ripen in late June to early August; dispersal begins in August when seeds are ejected from the pods and fall to the ground. 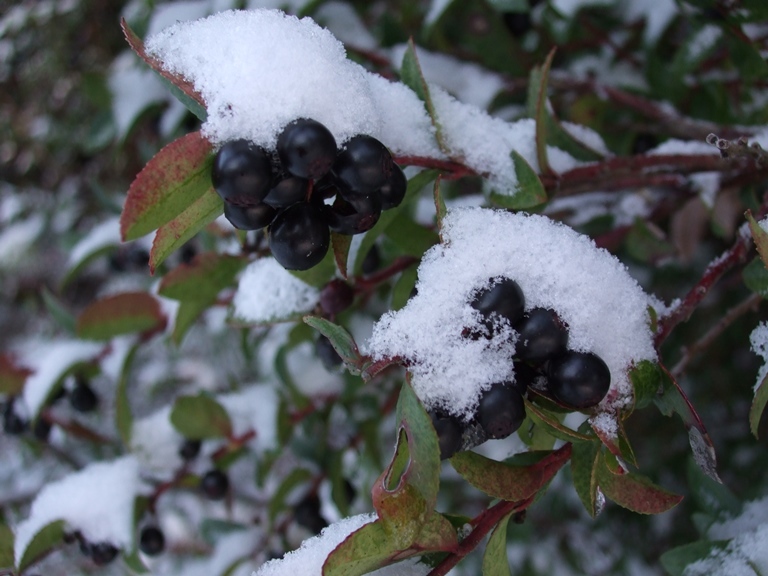 Propagation: Snowbrush seeds are able to remain viable in the soil for several centuries. They sprout in response to the heat of a fire. Temperatures of 176-203ºF (80-95ºC) are necessary to break the seed coat. Other scarification methods such as abrasion may also be used to break the seed coat and allow water imbibition. After scarification a cold stratification period is also required. They are difficult to keep alive in pots at the nursery, so are often difficult to find. Use by people: Deer brush was used by natives in various preparations as a cleansing solution in the sweathouse, a hair wash for dandruff, and for skin ailments such as diaper rash. 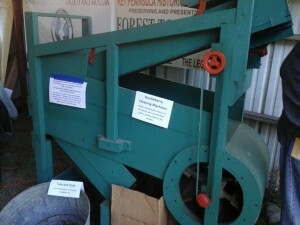 It was also used for other ailments such as arthritis. Use by wildlife: Snowbrush is eaten by deer, elk and mountain goats. Small mammals and birds eat the seeds. Butterflies are attracted to the flowers. Common Buckbrush or Wedgeleaf Ceanothus, C. cuneatus is found from the Willamette Valley and the Oregon Cascades southward, throughout much of California to Baja California in Mexico. 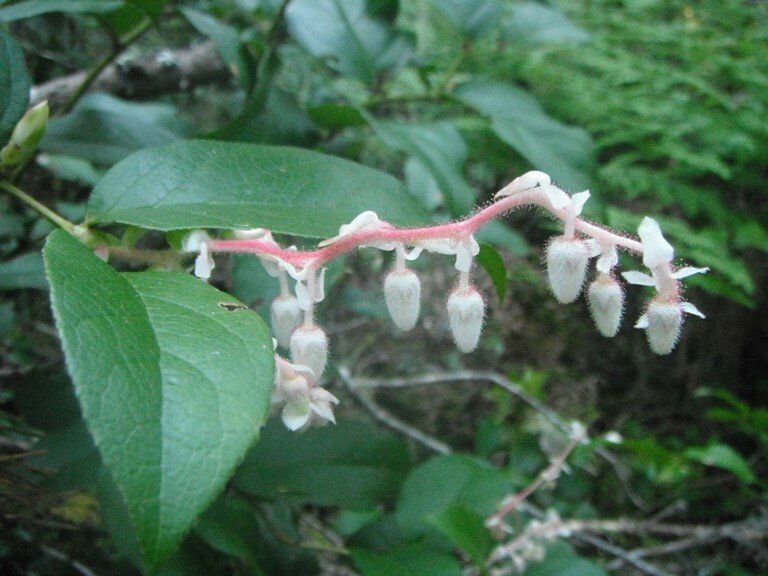 Douglas writes that it is “abundant near the sources of the Multnomak river.” It usually grows 3-6 feet (1-2m), sometimes taller and has attractive white flower clusters, sometimes tinged with blue or lavender. Harvester ants have been known to cache its seeds, which require fire in order to germinate. This entry was posted in Evergreen Shrubs on November 30, 2015 by habitatdana. Relationships: There are only 2 recognized species of Paxistima, Cliff Green, P. canbyi occurs in the eastern United States. 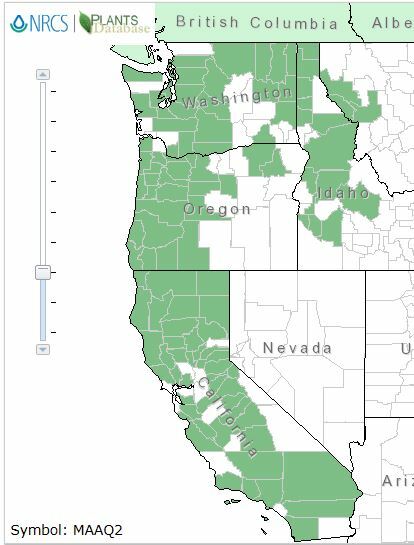 Distribution of Oregon Boxwood from USDA Plants Database. 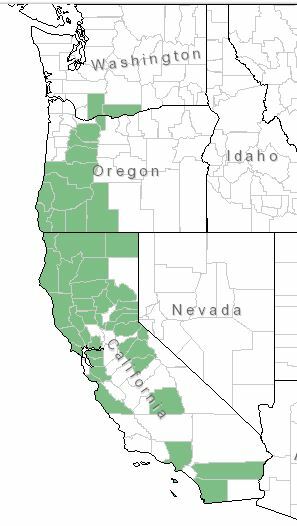 Distribution: Oregon Boxwood is found from British Columbia to Marin County, California and in the Rockies from Alberta to New Mexico. Growth: With a slow to moderate growth rate, Oregon Boxwood rarely exceeds 3 feet (1m), usually only reaching 8-30 inches (20-80 cm). It is fairly long-lived. 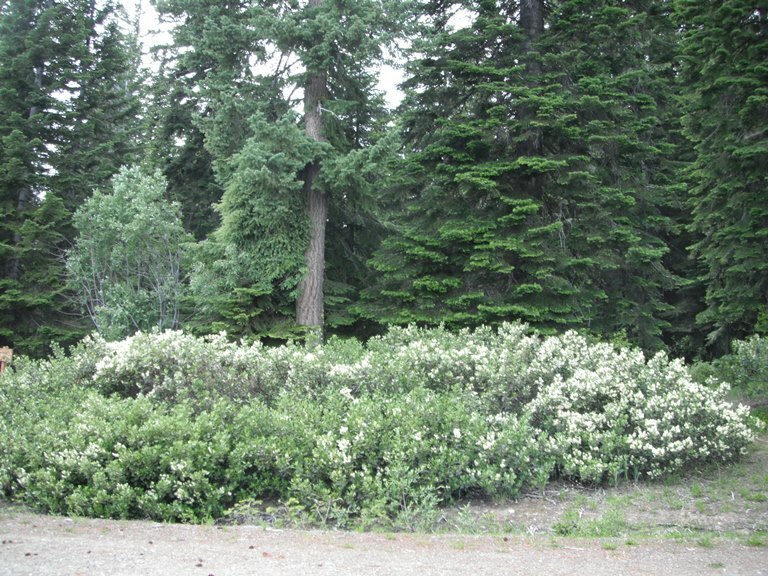 Habitat: Oregon Boxwood is most often found in the mountains in relatively dry, open, sunny sites or open forests. 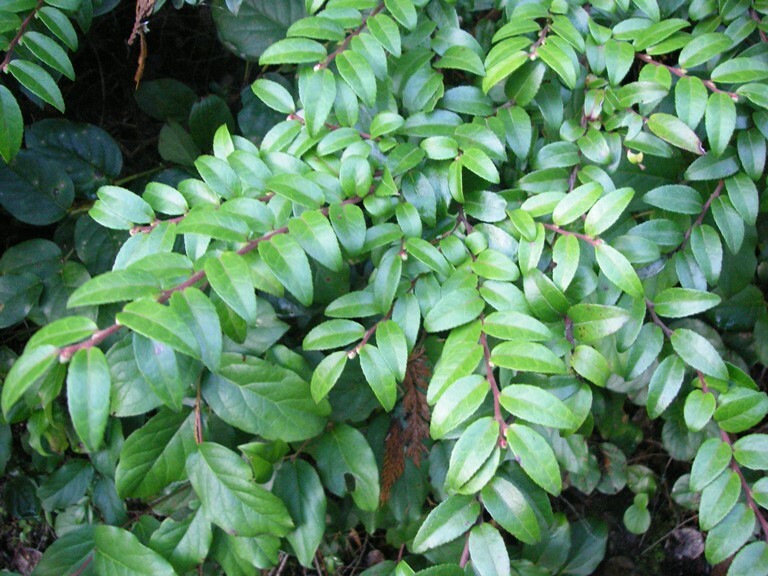 Distinguishing Characters: Oregon Boxwood is easily distinguished from other native evergreens by its opposite leaves with toothed margins. 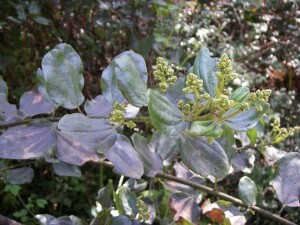 Its flowers are maroon or mahogany, very small but fragrant. Small, oval capsules contain only one or two seeds. Each seed is mostly surrounded by a white fleshy aril. Tiny Maroon or Mahogany Flowers are interesting. 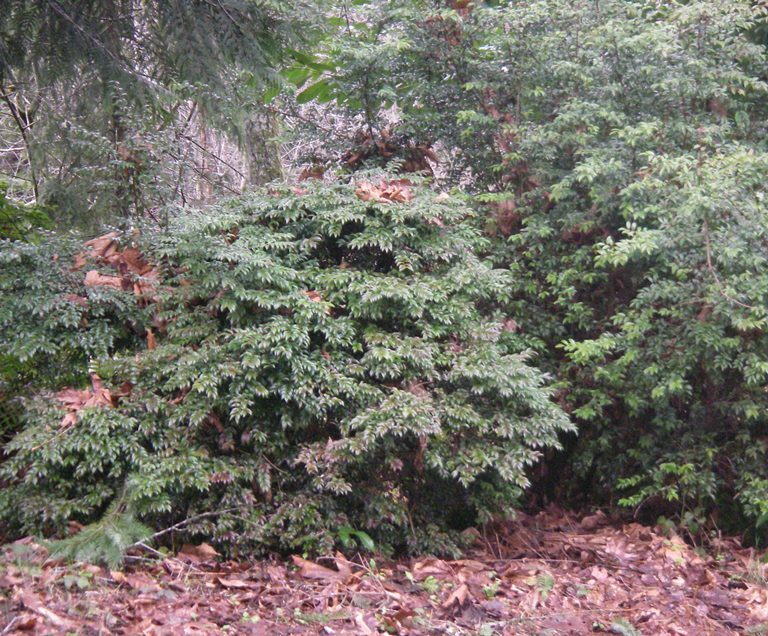 In the Landscape: Oregon Boxwood can be used similarly as are the cultivated shrubs it resembles, Boxwood, Buxus sempervirens, or Japanese Holly, Ilex crenata. It can be used as a border or a low-growing hedge, or in a woodland garden or rock garden. It needs a well-drained soil; it will not perform well with too much water. Phenology: Bloom Period: April-June; Seed capsules ripen July-September. 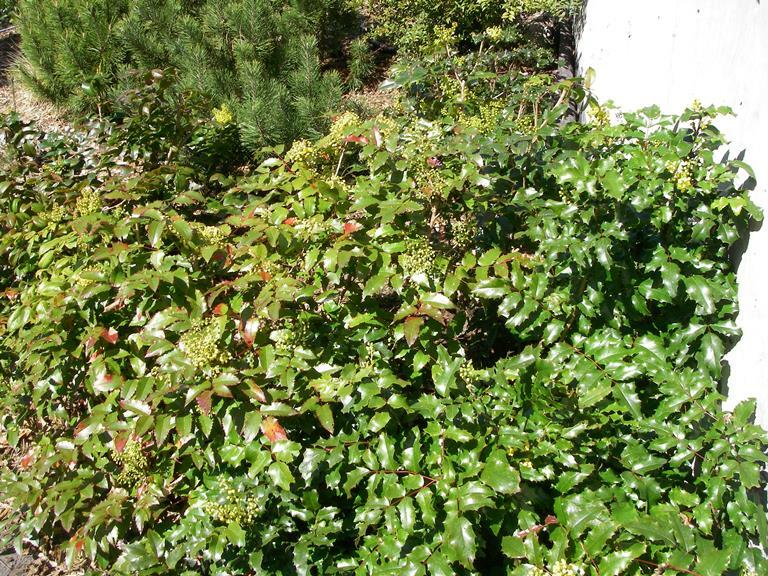 Propagation: Oregon Boxwood is easily propagated by softwood cuttings or by layering. Seed propagation is difficult but success may be achieved with a cool stratification period for several months. 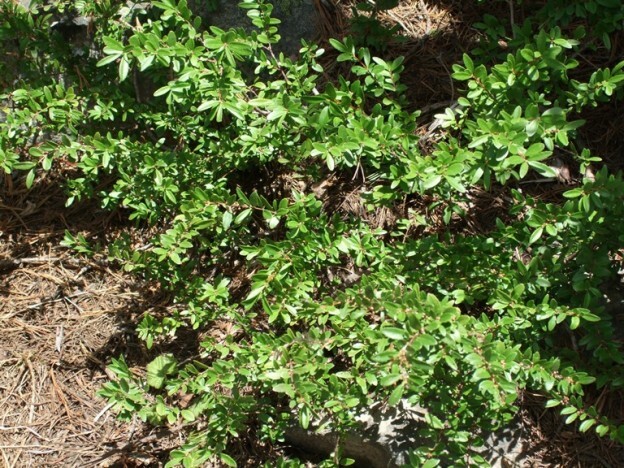 Use by people: Oregon Boxwood is sometimes used as greenery in floral arrangements, but care should be taken not to decimate native populations when collecting. Use by Wildlife: It is considered an important forage food for deer, elk and moose. Mountain Sheep and grouse also eat it. Although there is no evidence that seeds are disseminated by anything but gravity, the white, fleshy arils may entice ants to distribute the seeds. This entry was posted in Evergreen Shrubs on November 18, 2015 by habitatdana. 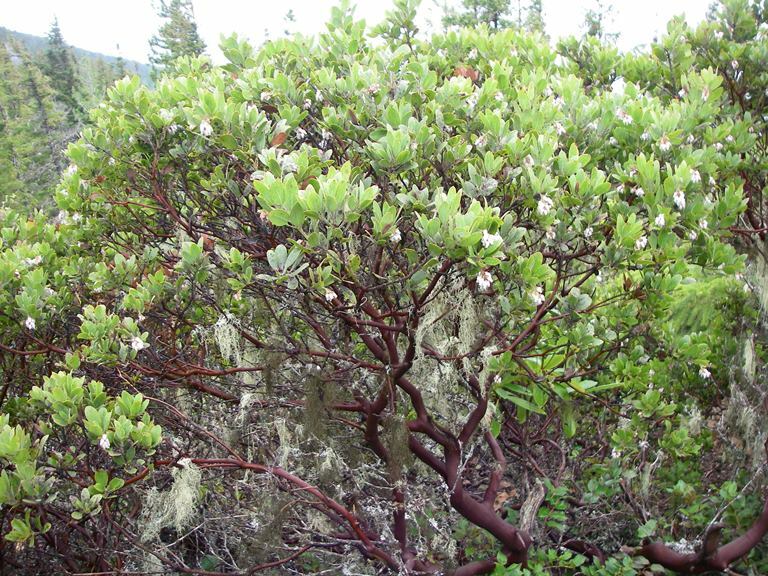 Names: Fremont Silktassel is also known as Bearbrush, Mountain Silktassel, Green-leaf Silktassel, California Feverbush, Quinine Bush, Flannel Bush, or Upland Silktassel Bush. Garrya is named after Nicholas Garry of the Hudson’s Bay Company. This species is named for John Charles Fremont “the Pathfinder,” an explorer and politician of the American West. 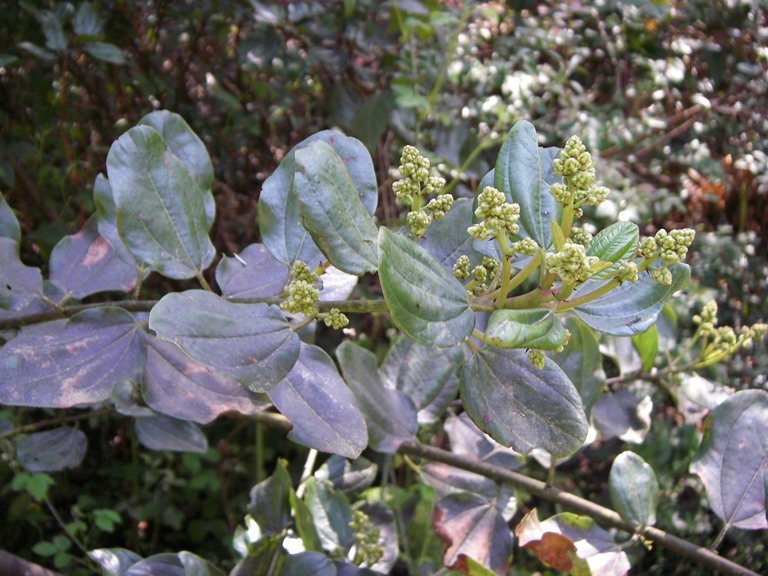 Relationships: There are about 18 species of Garrya in North and Central America and the Caribbean; with 8 species from the U.S, mostly limited to the southwest and southern Pacific Coast. 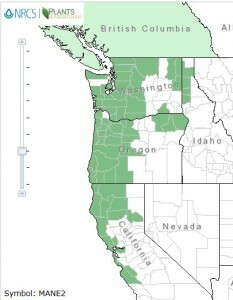 Distribution: Fremont Silktassel reaches the farthest north, barely reaching into Washington along the Columbia River Gorge. 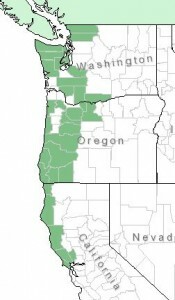 In Oregon, it is mostly found west of the Cascades. In California, it is found in the Sierras and coast ranges; with a disjunct population in and around San Diego County. 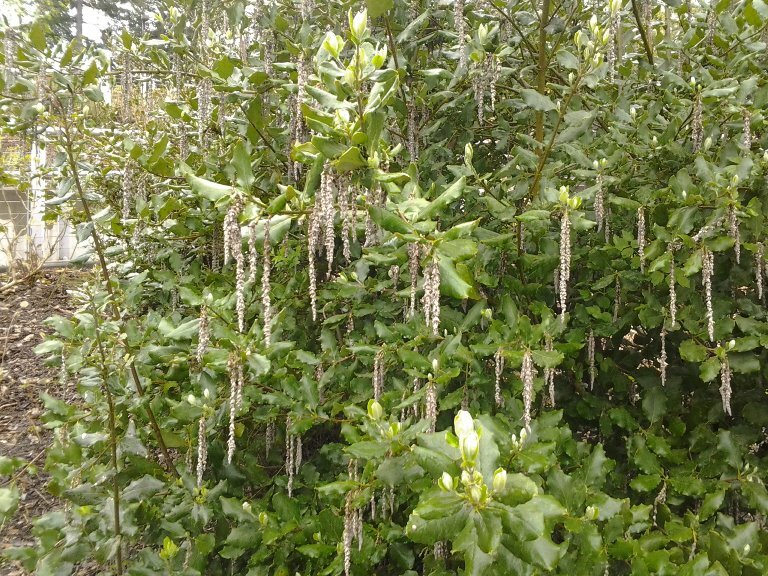 Garrya elliptica, the Coast Silktassel, also native to the coast ranges of Oregon and California, is often grown ornamentally for its long pendulous catkins. Growth; The Fremont Silktassel grows 3-9 feet (1-3 ft.). Habitat: It growsin woodlands and chaparral canyons. Diagnostic Characters: The opposite leaves of Fremont Silktassel are oval-shaped, yellow-green, with light undersides. 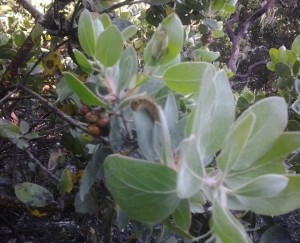 (In contrast, Garrya elliptica has wavy-edged, dark green leaves with gray, wooly undersides). Male and female flowers are borne on separate plants in yellowish to purple catkin-like racemes, 3-9cm long. Flowers are in cup-like bracts, which are densely silky on female plants. Fruit are round, purple berries that are hairy when young. 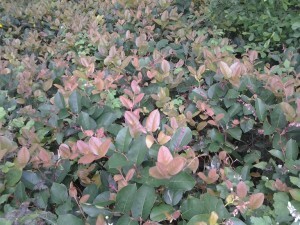 Young branches are brownish-purple. Phenology: Bloom Period: January to May. Fruit ripens: August to December. Propagation: Seed is best sown as soon as it is ripe in a cold frame. Germination requires overwinter stratification (30-120 days) and may take two or more years to germinate. Seeds may benefit from soaking in 100ppm of gibberellin for 17 hours following the stratification period. Cuttings should be taken from a parent plant of the desired gender. They may be taken of half-ripe wood, with a heel in August, or of mature wood with a heel in December or January. 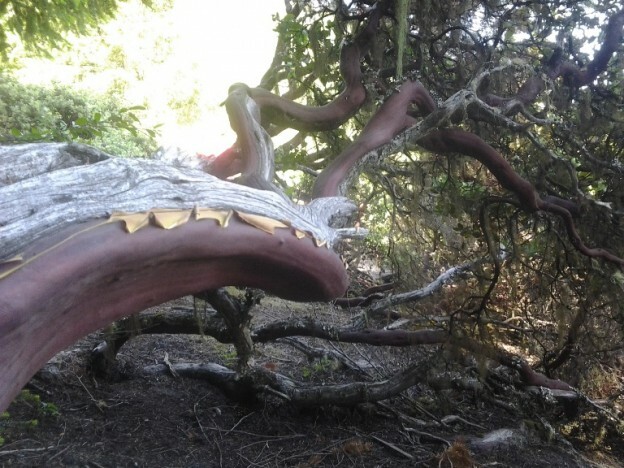 This shrub sprouts quickly from its root crown to recover from wildfire. 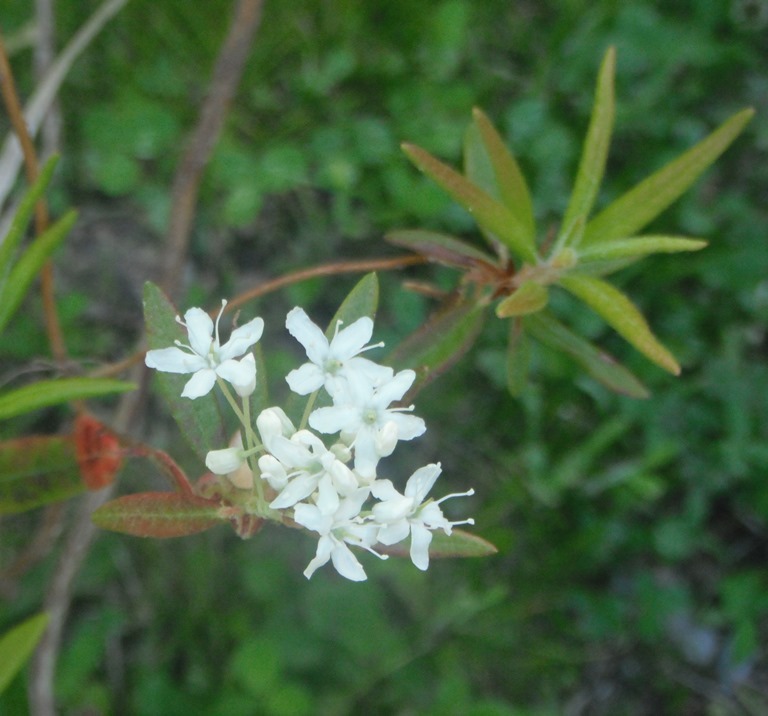 Use by People: Early settlers used the leaves of this plant to make a tonic, for fevers, as a substitute for quinine. Use by Wildlife: Fremont Silktassel is browsed by Mule Deer in winter and spring. The fruit is eaten by songbirds, mountain quail, gray fox, and rodents. It provides good cover for black bear, mule deer, and various birds and small mammals. Hybrids of Garrya elliptica and G. fremontii are given the name (Garrya x issaquaensis). They have spectacular long catkins like Garrya elliptica but are more cold tolerant. The first known hybrid, ‘Pat Ballard’ was grown from a seed that occurred in its namesake’s garden in Issaquah, Washington. Another cultivar, ‘Carl English’ is named for the Army Corps of Engineers horticulturalist who designed and built the botanical garden at the Hiram S. Chittenden Locks in Ballard, Washington. Another variety, ‘Glasnevin Wine,’ was more recently developed in Ireland. Garrya elliptica is much more common in landscapes. This entry was posted in Evergreen Shrubs on November 16, 2015 by habitatdana. Labrador Tea is found throughout the northern latitudes, including Greenland as its name suggests. It has white flowers. The undersides of older leaves are covered with a rusty brown-colored fuzz. Natives and European settlers and traders used the leaves for tea, both as a beverage and medicinally. 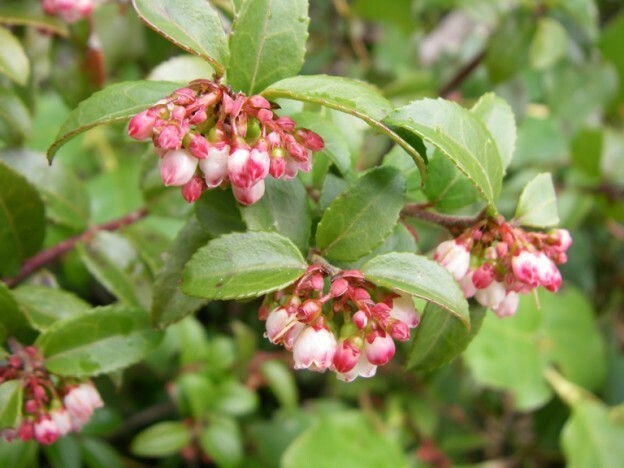 It should be consumed in moderation and not be confused with Trapper’s Tea, Bog Laurel, or Bog Rosemary which all lack brown fuzz and are toxic. 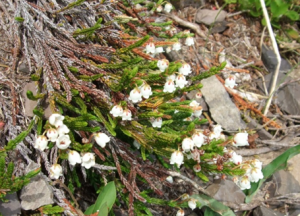 Trapper’s Tea is also known as Western Labrador Tea. It is similar to Labrador Tea but the leaves have whitish hairy undersides. It is more common east of the Cascade crest in Washington and in Oregon and California. Although it is known to be toxic, some interior tribes drank a tea made from the leaves of this plant. *Many now place Ledum in the larger genus Rhododendron. 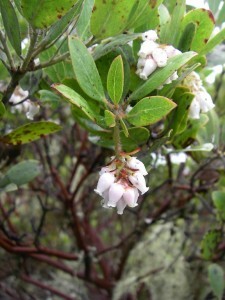 Alpine Laurel is also known as Western Bog Laurel, K. polifolia. It is native to western North America. Its small, attractive, rose pink flowers are borne in a truss. This small shrub is sometimes grown in gardens but is somewhat difficult to keep alive. Bog Rosemary is also found throughout the northern latitudes. With its small, pinkish urn-shaped flowers, this small shrub has long been prized as a garden ornamental. I have never seen it live for long in the landscape—it needs to be planted in an appropriate location with plenty of moisture. In nature, Bog Rosemary grows on little moss hummocks surrounded by swamp. Similarly, in Greek mythology, Andromeda was a beautiful princess that was chained naked to a rock in the midst of the sea, as a sacrifice to a sea monster. The Greek hero, Perseus rescued her and subsequently married her. Bog Cranberry is another bog plant found throughout the northern latitudes. It is also known as Small Cranberry. Cranberries are sometimes placed in their own genus, Oxycoccus (oxy: acid; coccus: round berry). 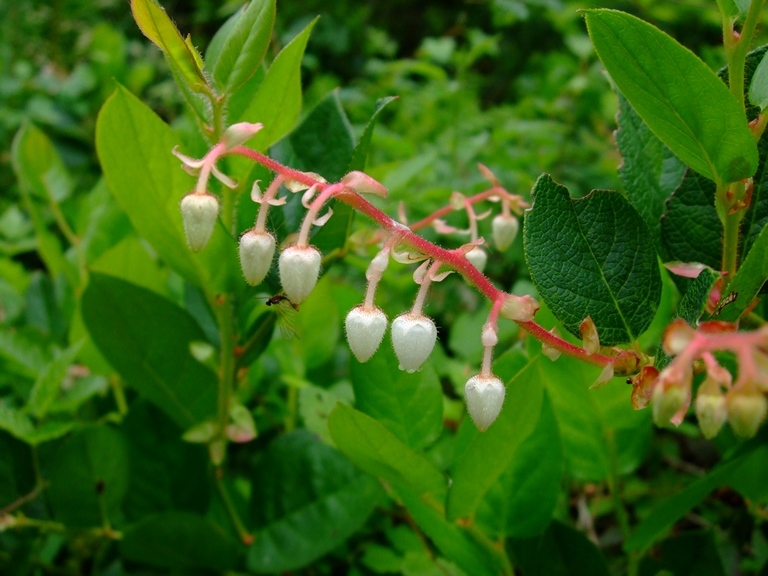 Bog Cranberry is a low, creeping shrub with small pink, nodding flowers like miniature shooting stars. 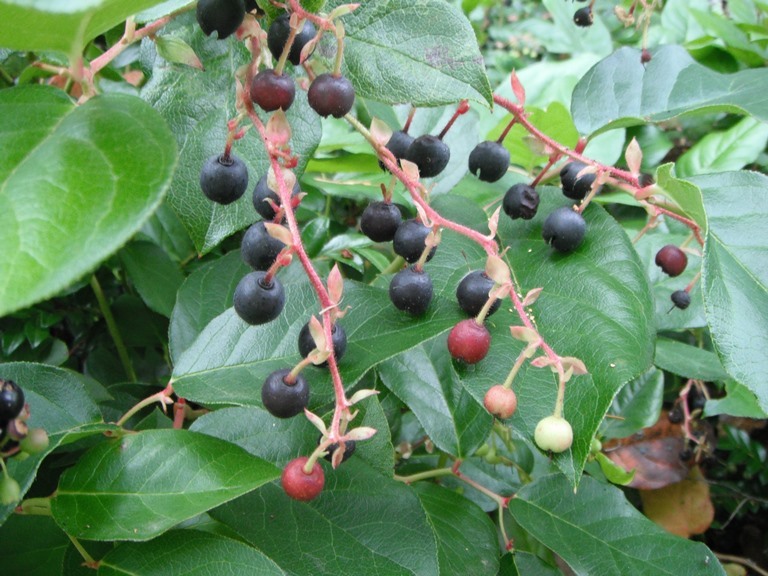 The fruits are pink to dark red, smaller than the commercially grown V. macrocarpon. Natives ate the tart berries fresh or cooked; or stored them in moss or dried into cakes for later use. 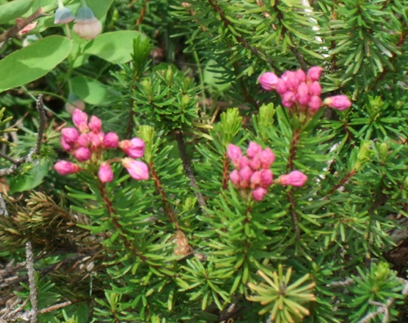 We have four mountain heathers almost exclusively found in alpine or subalpine parkland. They are White Mountain Heather, Cassiope mertensiana, Alaska Bell heather, Harrimanella stelleriana, Pink Mountain Heather, Phyllodoce empetriformis, and Yellow Mountain Heather, P. glanduliflora. All are very difficult to keep alive in lower elevation gardens. It is perhaps better to find cultivated varieties of similar species to use in your garden and leave these gems in their natural environment. 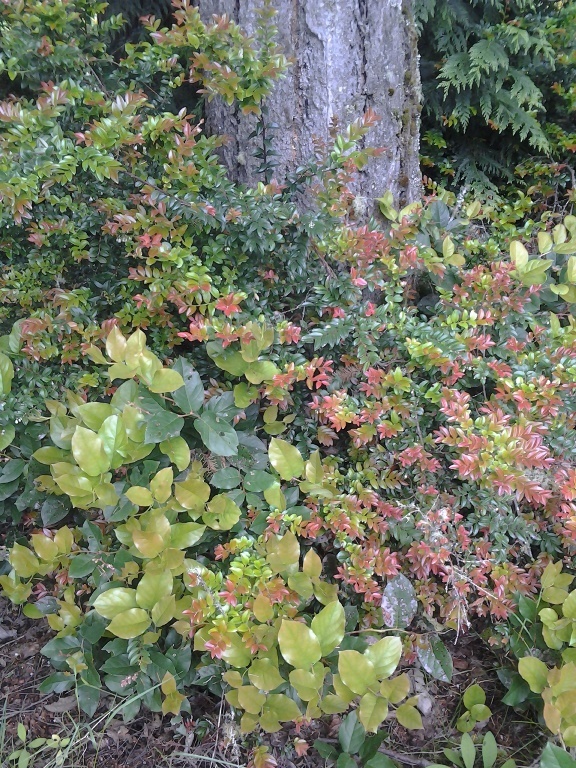 Two other alpine heather-like plants can be adapted to the garden. The Alpine Azalea, Loiseleuria procumbens has pink bell-shaped flowers and makes a charming addition to a rock garden. 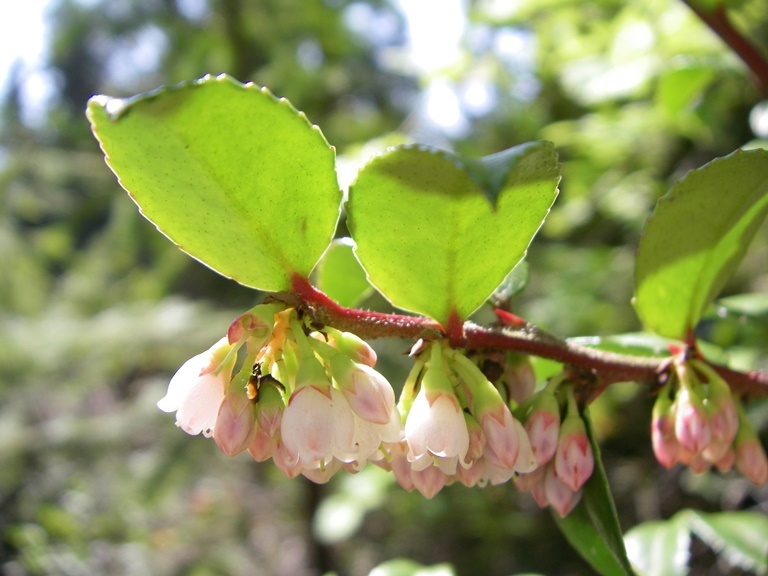 It is easily propagated by cuttings or layering but is listed as a “sensitive” species in Washington, so any wild collecting should be undertaken judiciously. 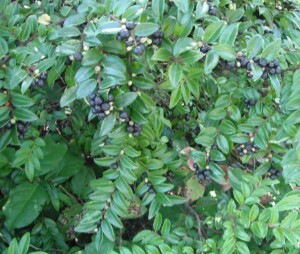 Black Crowberry, Empetrum nigrum, is not an ericad but is in a related family, empetraceae. It has black berries, sometimes eaten by natives, but a favorite of bears. 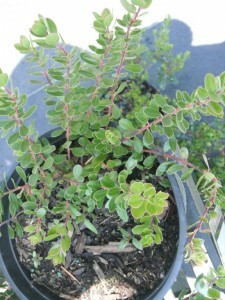 This low, creeping, mat-forming shrub is easily propagated by cuttings. This entry was posted in Evergreen Shrubs on November 2, 2015 by habitatdana. Relationships: There are about 70 species of Arctostaphylos. All, but one, are evergreen. Shrub forms are called Manzanita; low-growing groundcovers, and alpines are usually called Bearberries. Most are native to the Western United States with about 55 species confined to California. Three of the Bearberries have a circumpolar distribution, found in Northern North America and the northern regions of Europe and Asia. 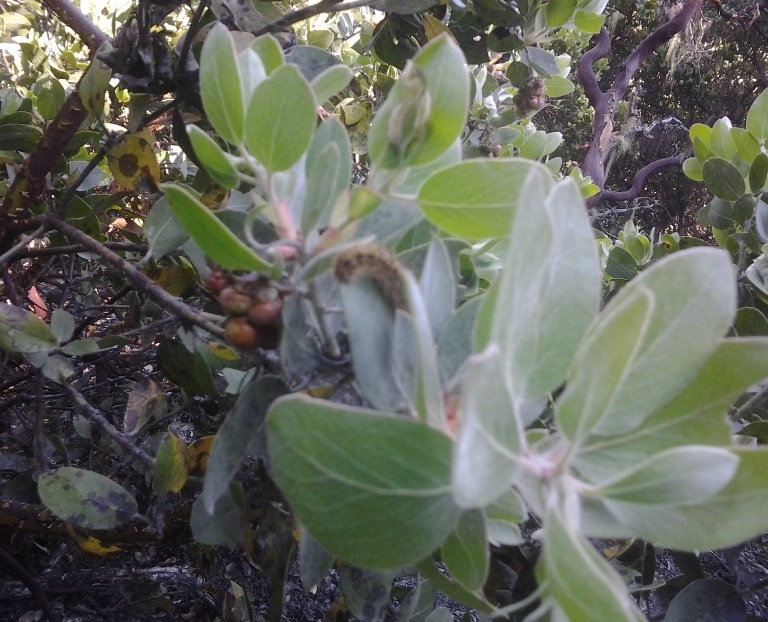 They and other low-growing Arctostaphylos sp. will be discussed in the section on groundcovers. 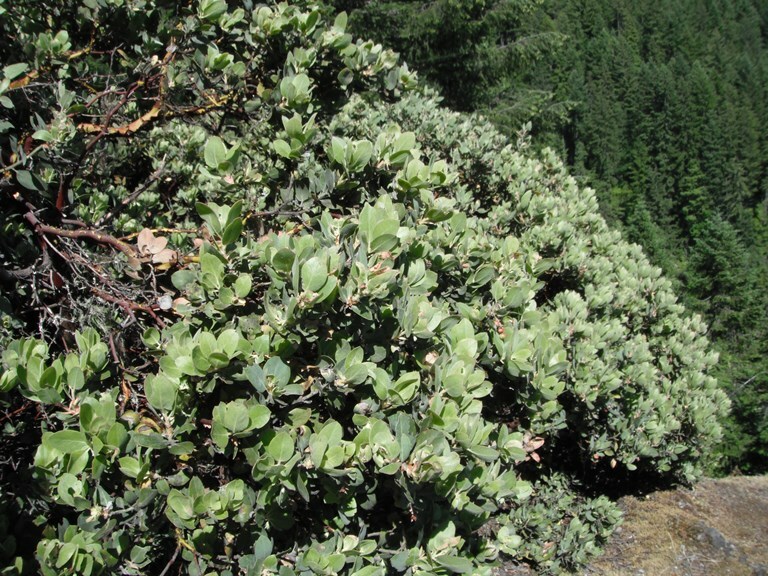 Distribution: Hairy Manzanita is found from Vancouver Island in British Columbia to the coast of Northern California, mostly on the west side of the Cascade Mountains. Hairy Manzanita can reach tree size. It has very interesting branching patterns. 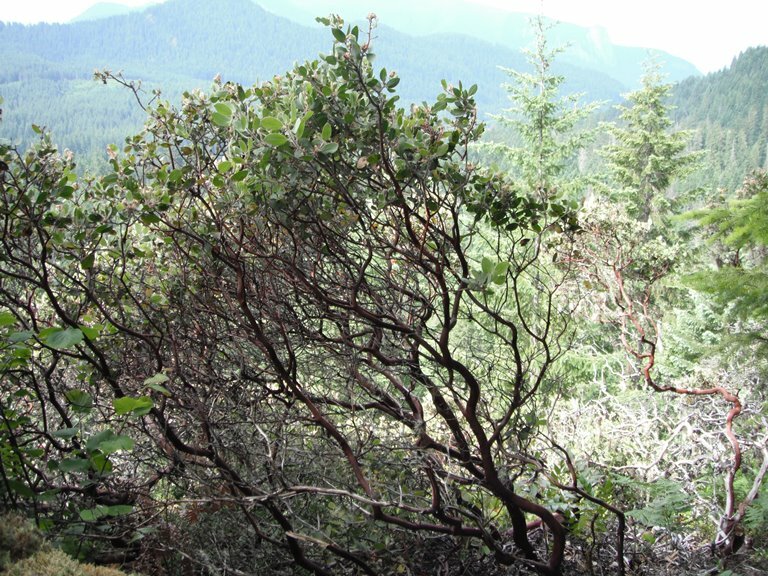 Growth: Hairy Manzanita grows at a moderate rate up to 15 feet (5m). Habitat: It is found in dry, open, sunny places and rocky hillsides, often in disturbed areas. 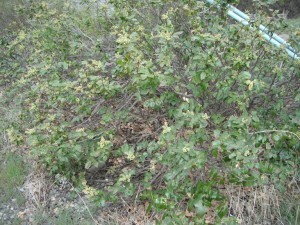 It is a bushy shrub that may be erect or spreading. 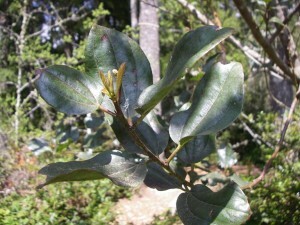 Diagnostic Characters: Its grayish-green, hairy foliage and branches with peeling reddish, brown bark give it a very distinctive appearance in the Northwest. The flowers are the typical white to pinkish bells of many of our Ericads. 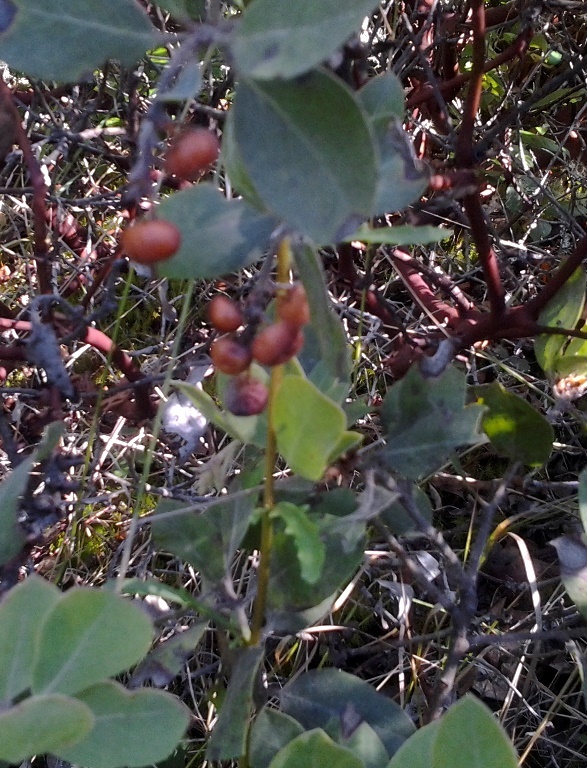 The berries are a brownish-orange. In the landscape: it is an attractive addition to southern or western exposures. 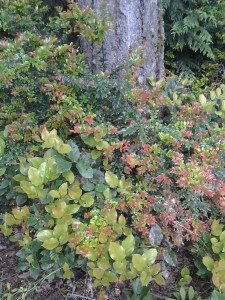 The gray-green foliage makes a subtle contrast with other shades of green. The reddish-brown, peeling bark adds interest along with its delicate pinkish-white, bell-shaped flowers and the orange, almost coppery, colored berries. It is often sought out by gardeners, but unfortunately is not readily available due to difficulty in propagation. Phenology: Bloom Period: March-June, Fruit ripens July to August. Propagation: Hairy Manzanita has a very hard seed coat. In nature it must go through the digestive tract of an animal or a fire before it will germinate. Many sources suggest different methods of scarification including soaking in sulfuric acid for 24 hours, soaking in boiling water for 10- 20 seconds, or burning straw on top of them. After scarification, seeds need to be stratified at 40ºF (4ºC) for 2 months, some recommend a warm stratification for 60 days prior to the cold stratification. Heel cuttings taken from August to December should be treated with a hormone and stuck in a sand-peat media. Layering is perhaps the easiest method of propagation, but these plants do not like their roots disturbed and transplanting should be performed with great care. Use by people: A yellowish-brown dye may be made from its leaves. The hard wood burns with a bright light and is useful for making small tools. 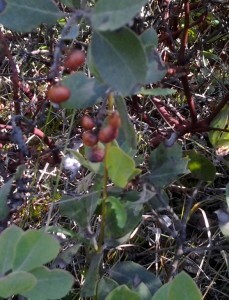 Some native people ate the berries. Use by Wildlife: Birds such as sparrows and grosbeaks and small mammals such as skunks and chipmunks also eat the fruit. Deer browse on the foliage. The dense evergreen foliage provides excellent cover for wildlife. Greenleaf Manzanita, Arctostaphylos patula In Washington, this species is only known to occur on the north shores of Lake Chelan and in Klickitat County near the Columbia River. It is found in the Cascades of Oregon and throughout much of the Southwest. 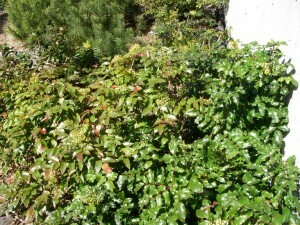 It grows 3-6 feet (1-3m) tall and has nearly round leaves and the characteristic smooth, red bark. 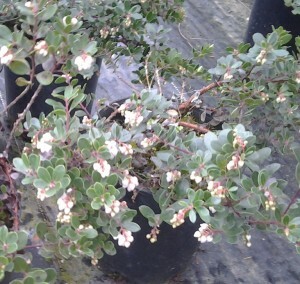 Media Manzanita, Arctostaphylos x media Green (pro sp. 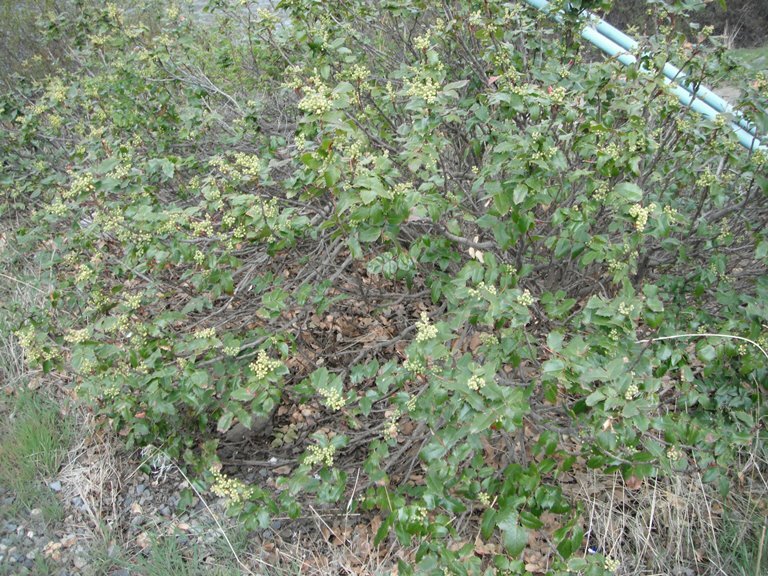 ), is a natural hybrid between Hairy Manzanita and Kinnikinnick (A. uva-ursi). Although it is most common on the Kitsap Peninsula in Washington State, it may occur wherever the ranges of its parents overlap. It is intermediate in both form and leaf characteristics. 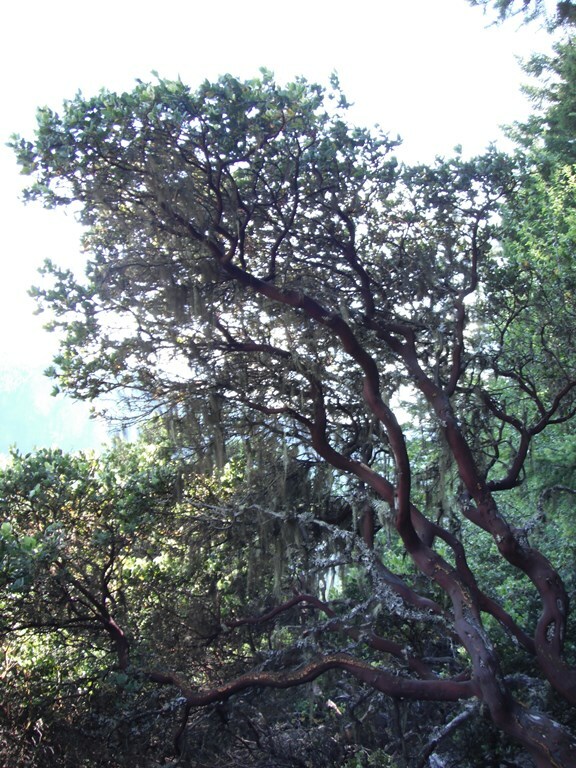 Media Manzanita only reaches a little over 2 feet (0.75m) tall but may spread up to 15 feet (5m). 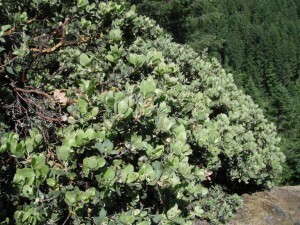 Leaves are dark, gray-green and not as hairy as Hairy Manzanita. Branches are a brighter red than Kinnikinnick. It is an attractive, spreading shrub or groundcover for dry, gravelly areas but is difficult to find in the nursery trade. Seeds are not usually produced; when they are, they either are not viable or are have a dormancy that is difficult to break. 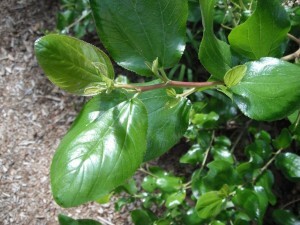 Propagation may be achieved by cuttings or layering. Media Manzanita at the nursery. Arctostaphylos columbiana x A. nevadensis: Hairy Manzanita also hybridizes with Pinemat Manzanita, A. nevadensis,where ranges of the two species overlap, most notably in the Mount Hood region and the Big Lava Bed in Oregon. Arctostaphylos patula x A. nevadensis may be found where A. patula occurs. Reportedly, in some areas, this hybrid may be so common that it is hard to find pure A. patula. Arctostaphylos patula x A. uva-ursi may also occur in the Lake Chelan area, but is not confirmed. Arctostaphylos columbiana x A. patula occurs in Oregon but is not known in Washington. *Many of these hybrids have been studied by the esteemed native plant expert, Arthur R. Kruckeberg. This entry was posted in Evergreen Shrubs on October 26, 2015 by habitatdana. 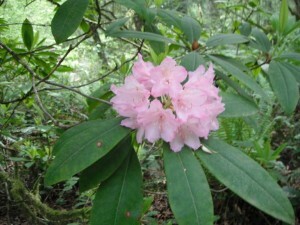 Names: The Pacific Rhododendron is also known as the Coast Rhododendron, California Rhododendron, or California Rosebay. 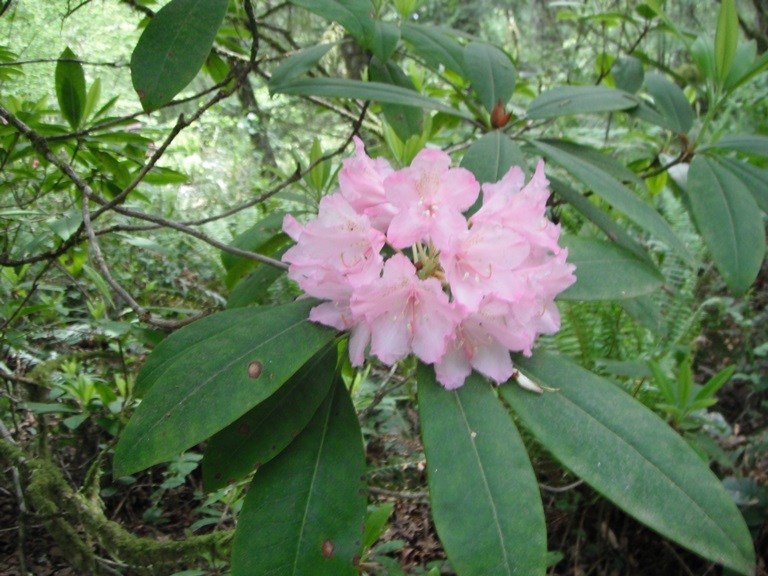 Rhododendron macrophyllum literally means, “Rose tree with big leaves.” It is the state flower of Washington State. Relationships: The rhododendron genus includes plants commonly known as azaleas. It is a very large genus with about 1200 described species. Most are found in China, Japan and neighboring countries; tropical species are found from Southeast Asia to New Guinea and Northern Australia. Relatively few are native to Europe and North America. 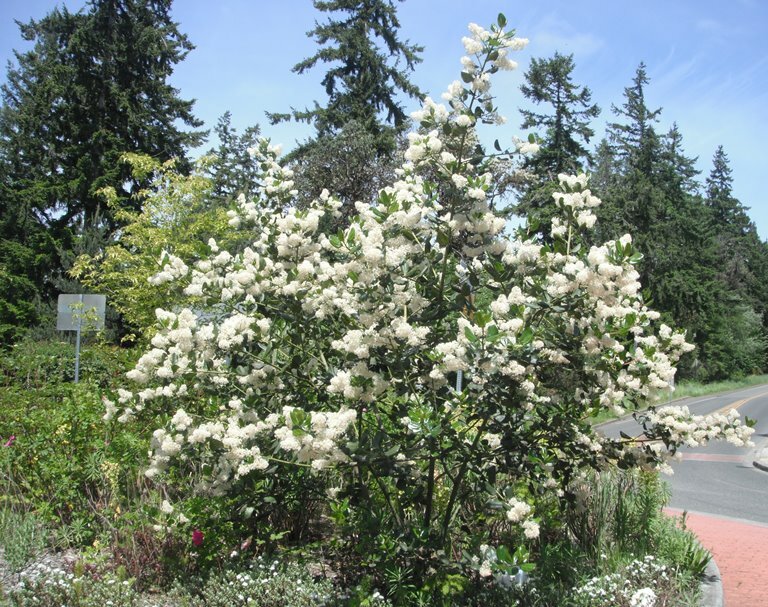 The Rhododendron Species Foundation in Federal Way, Washington, which is dedicated to the conservation, public display, and distribution of Rhododendron species has about 600 species in their display gardens along with many of the over 28,000 cultivated varieties. 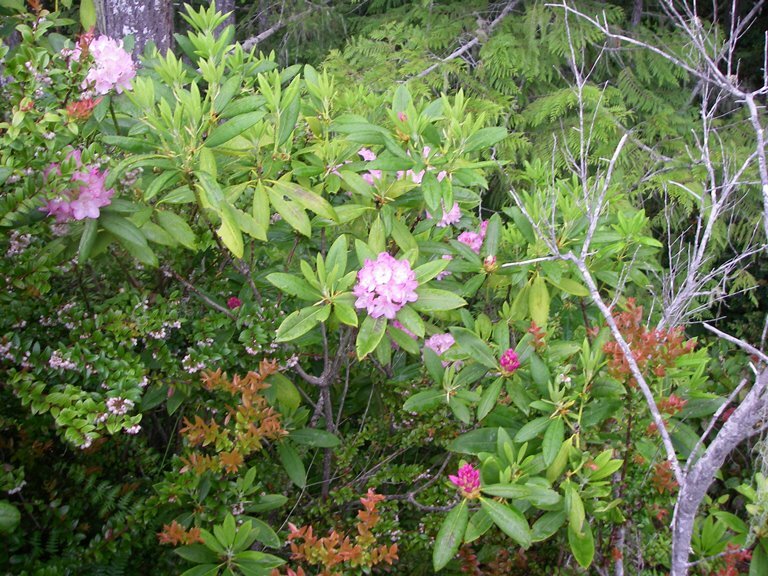 About 30 species are native to North America; the Pacific Northwest is home to only 5 species; two of which (Kamcahatka Rhododendron, R. camtschaticum and Lapland Rosebay, R. lapponiocum) are small prostrate shrubs from Alaska or Northern British Columbia. The other 2 species will be discussed in the section on deciduous shrubs. 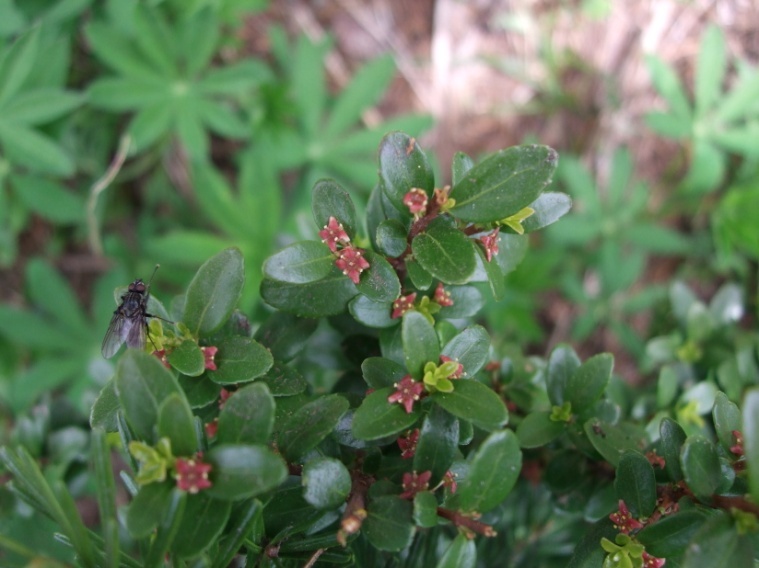 Labrador Teas, Ledum sp. 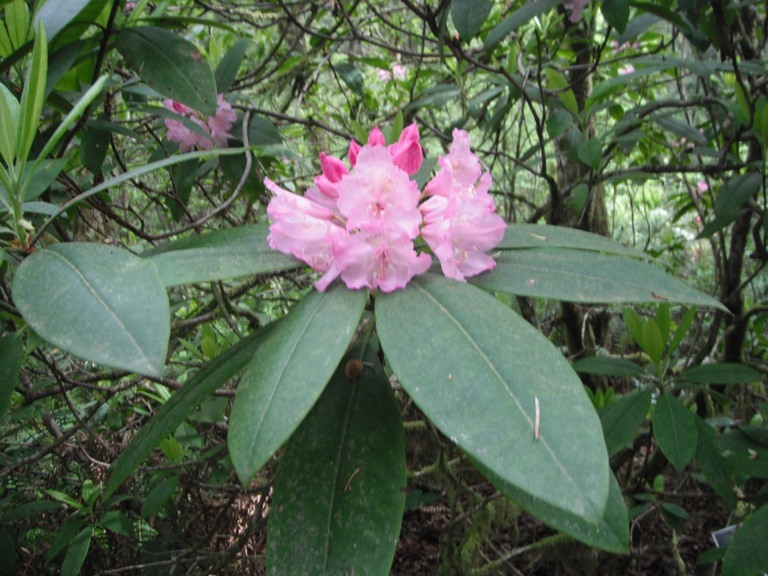 are also now often lumped into the Rhododendron genus. Distribution: The Pacific Rhododendron is found west of the Cascades from southern British Columbia to Northern California. Growth: It reaches to about 24 feet (8m); taller in the shade than in the sun. Habitat: It grows in in fairly dry open forests and edges. It commonly grows along roadsides in the rainshadow of the Olympic Mountains. 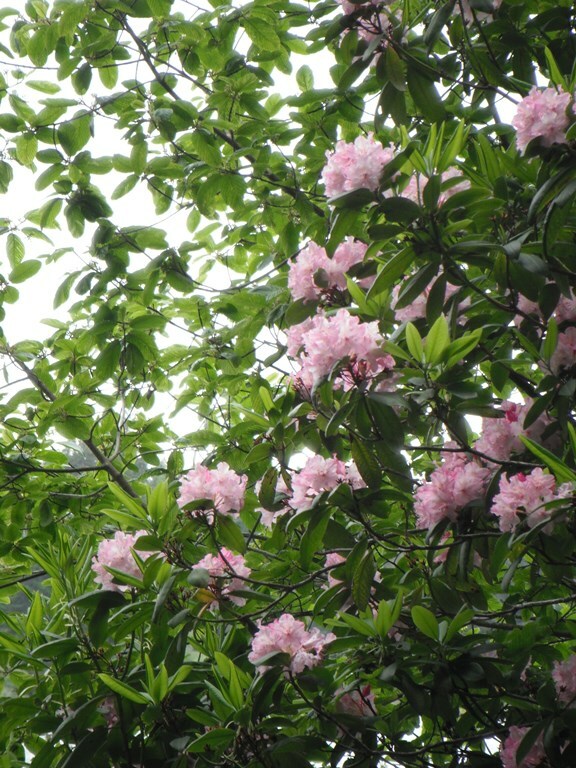 Rhododendrons have the largest, showiest flowers in the family, as in this Pacific Rhododendron. Diagnostic characters: The thick, leathery leaves of Pacific Rhododendron are oblong, 3-8 inches (8-20cm) long. The pink, sometimes white, bell-shaped flowers are borne in showy clusters called trusses. Each flower has 5 lobes with wavy edges. Seeds are produced in woody capsules. 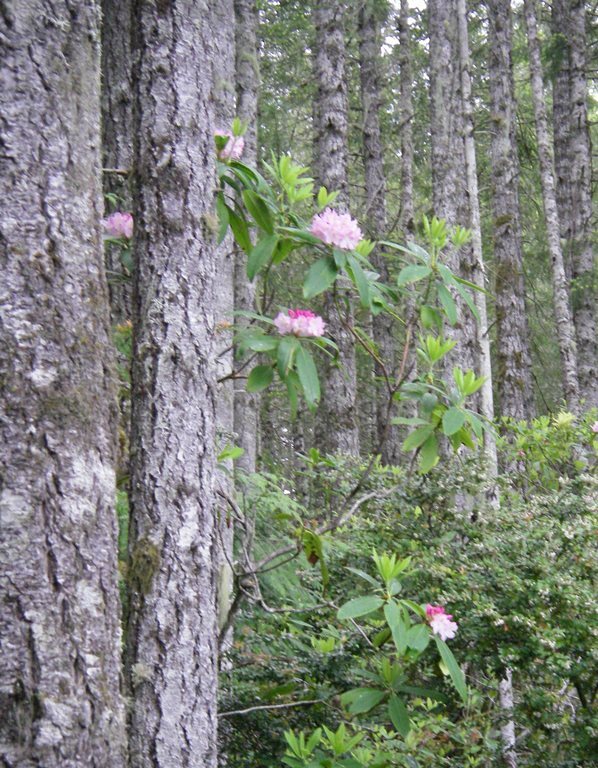 In the Landscape: Rhododendrons have long been a favorite of landscapers in the Pacific Northwest. 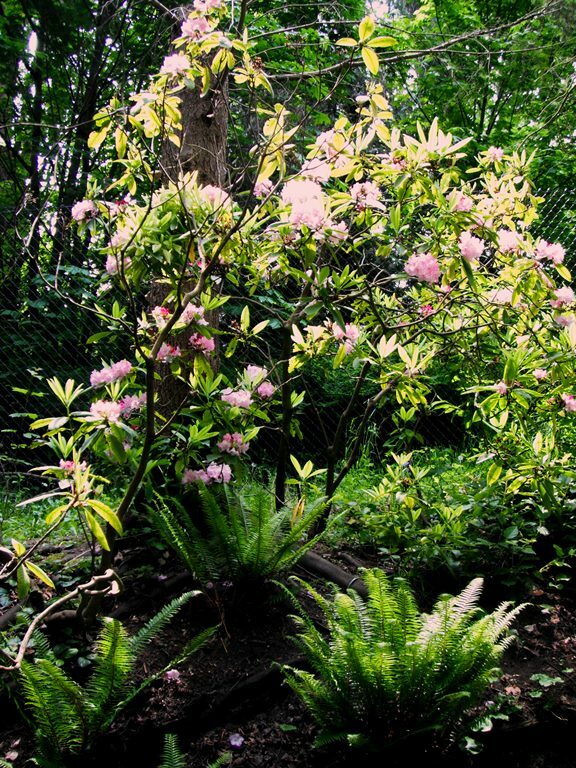 Although many may prefer the variety of flower colors, and forms in cultivated varieties, our native Rhododendron with its bold green leaves and spectacular pink flower clusters can find a place in both wild settings and more traditional landscapes. Even those that steer away from rhodies due to the fact that they are so common in northwest gardens may be convinced to include this native species in their yard! 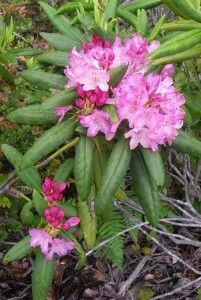 Pacific Rhododendron is also useful for erosion control on steep watersheds. Phenology: Bloom Period: April-May. Seed capsules ripen August to September. Propagation: Seeds do not require stratification, but require light to germinate. Seeds remain viable for 2 years. Collect softwood cuttings, May to September. Wounding and dipping in an IBA hormone aids rooting of cuttings. Peat and perlite is a preferred rooting medium; bottom heat and misting is also beneficial. 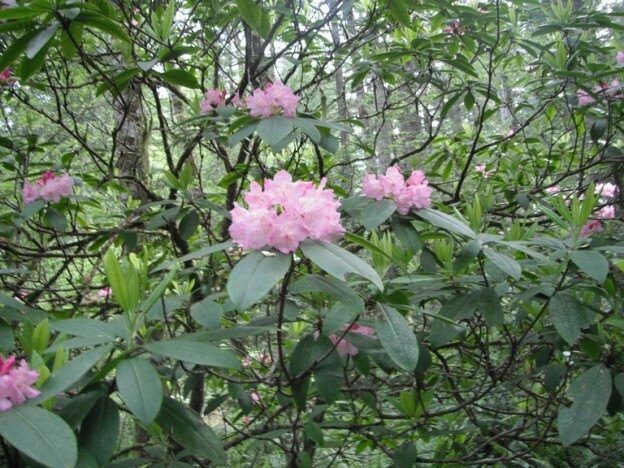 Use by people: Pacific Rhododendrons are of little use to people, except as an ornamental shrub. Flowers were used by natives as decoration, especially for dance wreaths. 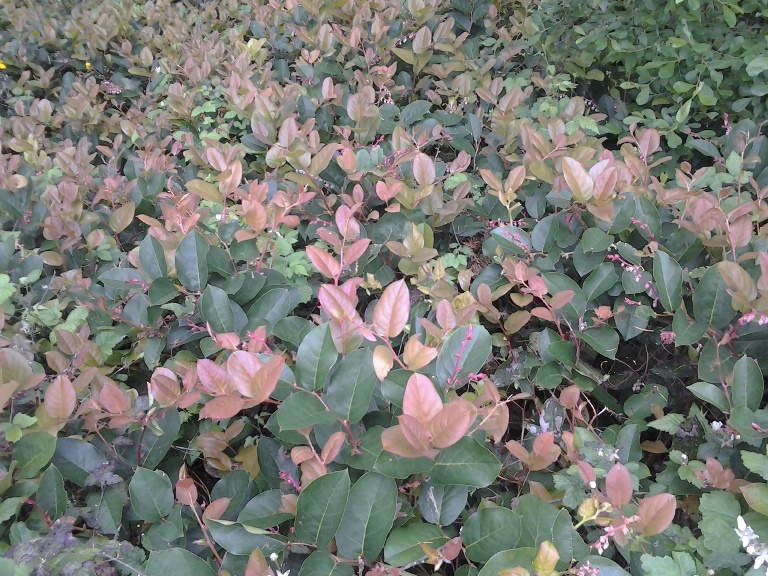 Use by wildlife: This shrub provides all year cover for wildlife but has very little food value. 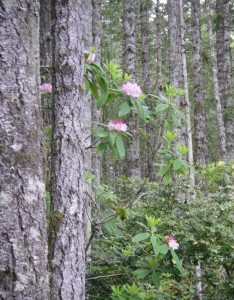 Deer and Mountain Beavers are among the few that browse on Pacific Rhododendron. This entry was posted in Evergreen Shrubs on October 14, 2015 by habitatdana. Names: Low Oregon Grape is also called Cascade Oregon Grape, Cascade Barberry, Dull Oregon Grape, Dwarf Oregon Grape or Longleaf Mahonia. 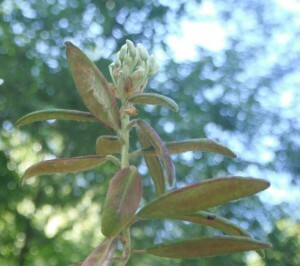 Nervosa refers to the fan-like veins in its leaves. It is called “dull” because its leaves are not as shiny as Tall Oregon Grape’s leaves and “long-leaf” because it has more leaflets making a longer compound leaf. This shorter species is referred to as Low Oregon Grape to distinguish it from Tall Oregon Grape, Mahonia aquifolium. 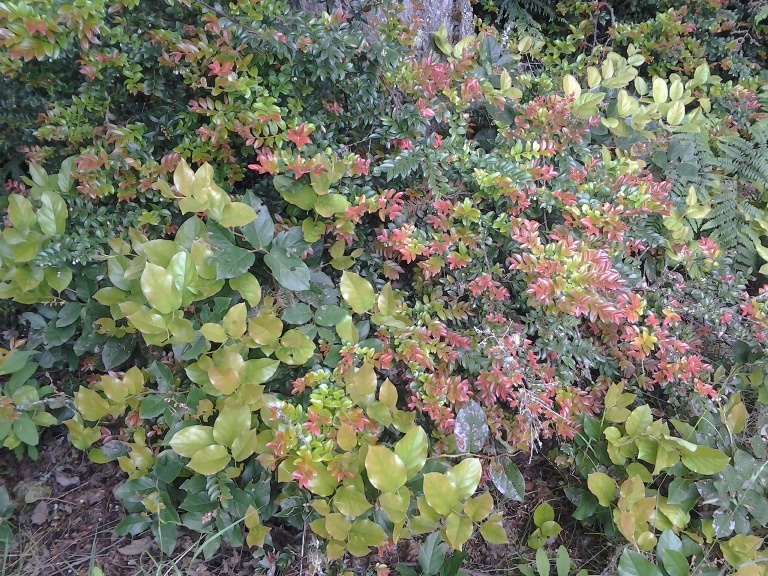 It is also known as Berberis nervosa. 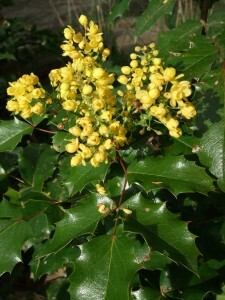 Some botanists have argued that the genus Mahonia is not different enough from the genus Berberis to warrant its own genus. 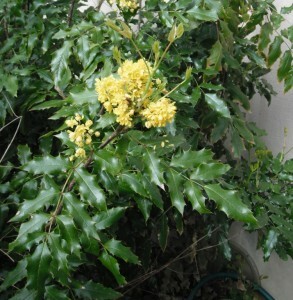 Mahonia is named after American Horticulturist, Bernard McMahon. Horticulturists have consistently continued to use the genus Mahonia to refer to those species with compound leaves that give them a very different appearance from barberries. Relationships: There are about seventy species of Mahonia in Asia, and Central and North America, about 13 in North America. 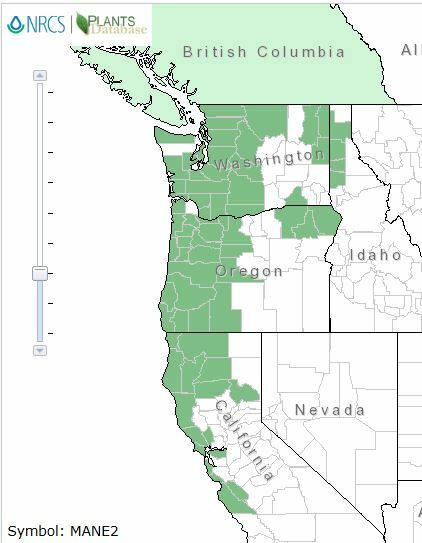 Three are found in the Pacific Northwest. Some cultivated varieties have been developed. 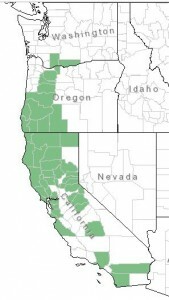 Distribution: It is found from southern British Columbia to central California, mostly west of the Cascade and Sierra Mountains; but it also occurs in northeastern Oregon and Washington and the Idaho panhandle. Growth: Low Oregon Grape usually grows slowly to about 2 ft. (60cm), but may grow taller, especially in deeper shade. It forms clumps, spreading by underground rhizomes to about 3 ft (1m) wide. Habitat: It grows in dry to fairly moist, open to dappled, shady woods. Diagnostic Characters: Mahonia nervosa is the easiest to distinguish from other native Mahonias; it has more leaflets, (9-19 per leaf) per ~12-inch (30cm) long leaf. Leaves are clustered toward the tip of the stem in a terminal “rosette.” Otherwise it is very similar to other Oregon Grapes with its spiny, leathery, often bronzy, compound leaves, bright yellow flowers and blue berries. 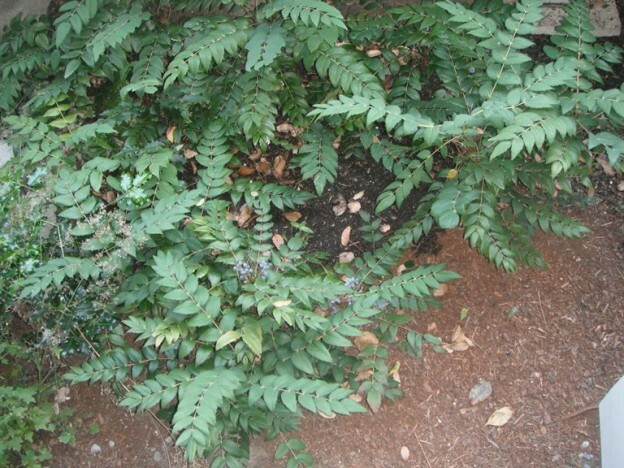 In the landscape, Low Oregon Grape is an excellent choice for dry shade. With its leathery, fern-like, leaves, it is an attractive groundcover or border plant for a shady woodland garden. Its prickly leaves make it useful for a low barrier. Sprays of golden-yellow flowers brighten gloomy, rainy spring days. 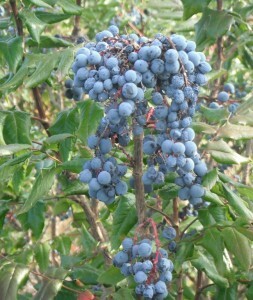 Flowers are followed by large clusters of blue berries with a waxy, whitish bloom. Phenology: Bloom Period: April-May. Fruits ripen August-September. Propagation: Seed is best sown as soon as it is ripe in a cold frame; seeds should not be allowed to dry out. Stored seed requires a stratification period of at least 3 weeks. Cuttings are best taken September-March, treated with hormone, and stuck in peat/perlite media; leaving only 1 or 2 leaflets and wounding the base of the cutting. Applying bottom heat is also beneficial. Layering and division are also possible. 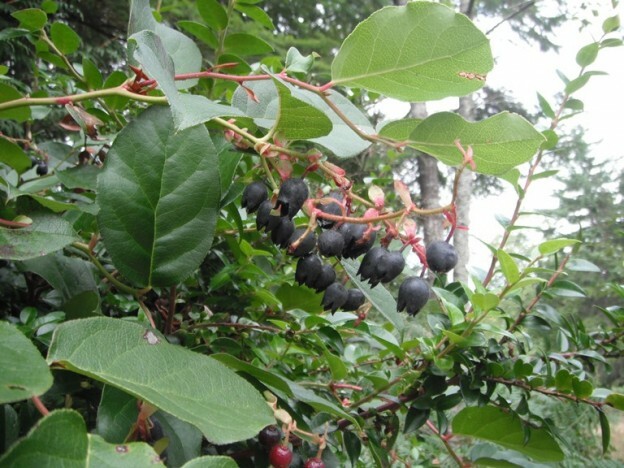 Use by people: The tart berries were eaten by natives, but not in quantity; they were more often mixed with sweeter berries such as salal. Today they are more frequently used in jelly or wine. The yellow roots were used for dying basket materials; especially Beargrass. The roots were also boiled to make a medicinal tea. 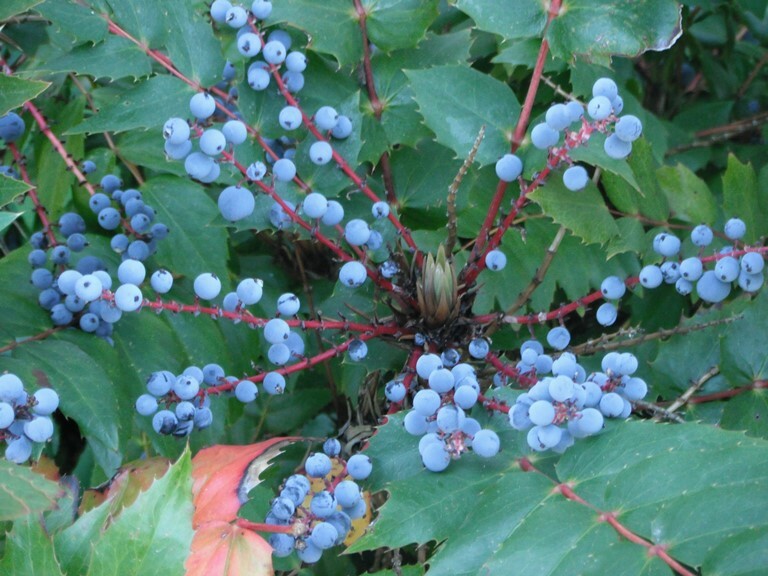 Use by wildlife: In some areas, Low Oregon Grape is browsed by Black-tailed Deer and Roosevelt Elk. Many small mammals also eat the foliage, especially the White-footed Vole. The fruits are eaten by many small birds and mammals. The nectar of the flowers are favored by Anna’s Hummingbirds. The plant provides cover for small birds and mammals. This entry was posted in Evergreen Shrubs on June 29, 2015 by habitatdana. Names: Oregon Grapes have leaflets with sharp spines along their margin. Because of this feature they are often confused with holly. 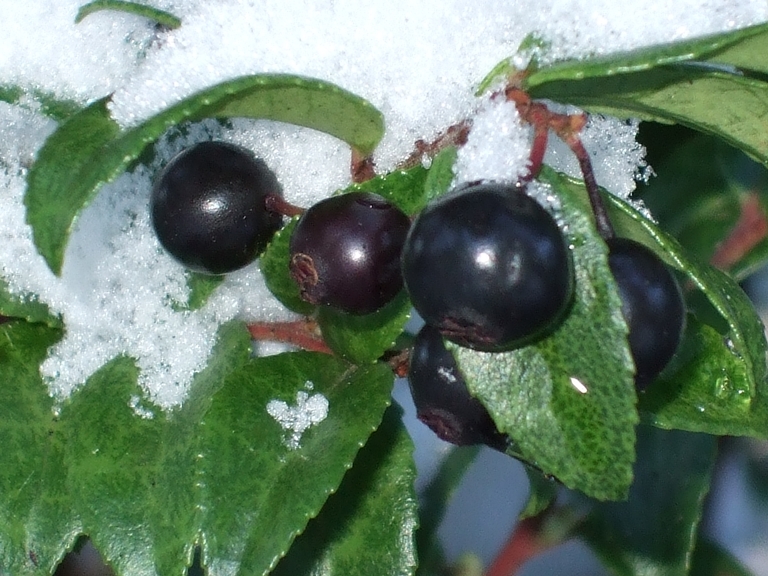 In fact, the species gets its name from the name for English Holly, Ilex aquifolium. Aquifolium literally means leaves that have curved hooks like an eagle’s beak (aquiline is similarly derived). 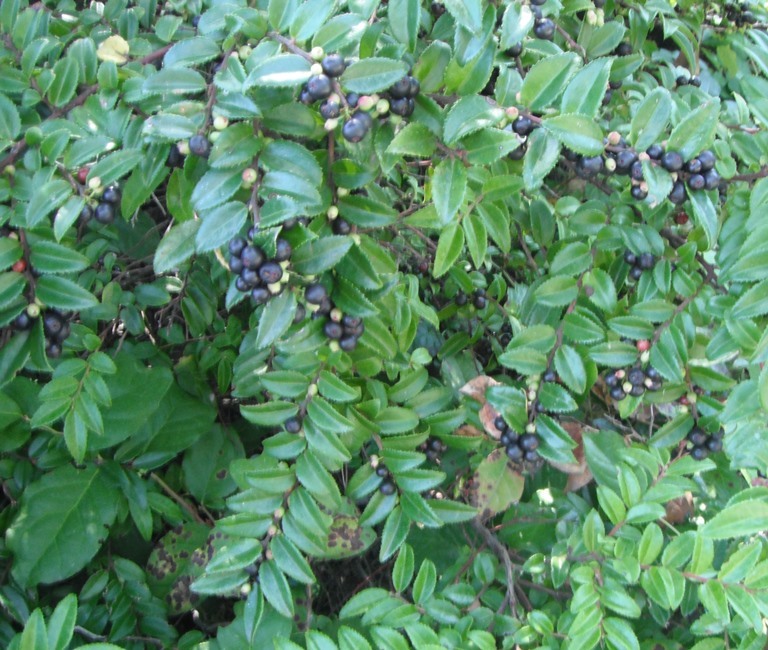 Other common names include Oregon Grape-Holly, Holly-leaved Barberry, Holly-leaved Oregon Grape, Oregon Hollygrape and Mountain Grape. It is the state flower of Oregon. This species is referred to as Tall Oregon Grape only to distinguish it from Low Oregon Grape, Mahonia nervosa. 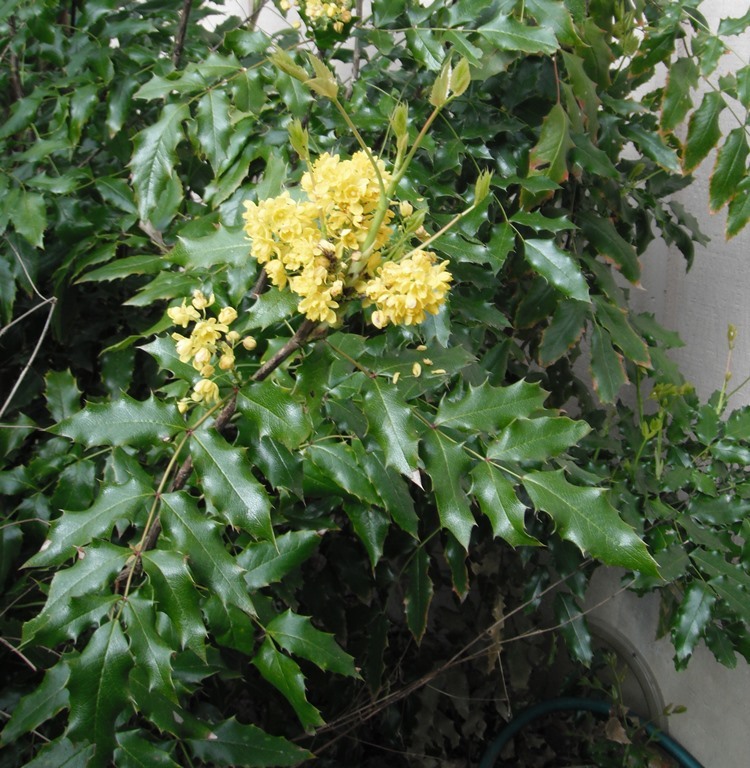 Mahonia aquifolium is also known as Berberis aquifolium. 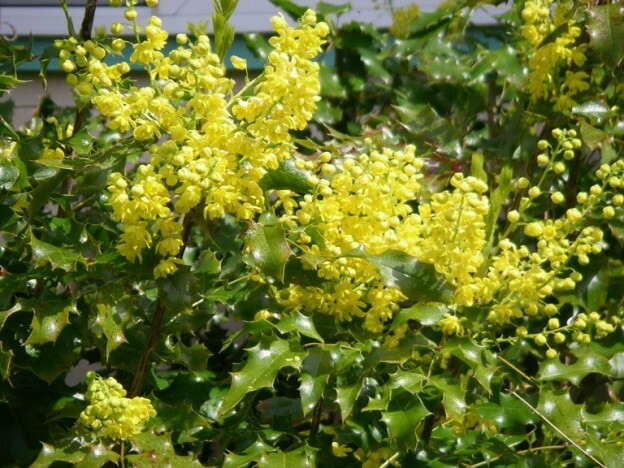 Some botanists argue that the genus Mahonia is not different enough from the genus Berberis to warrant its own genus. 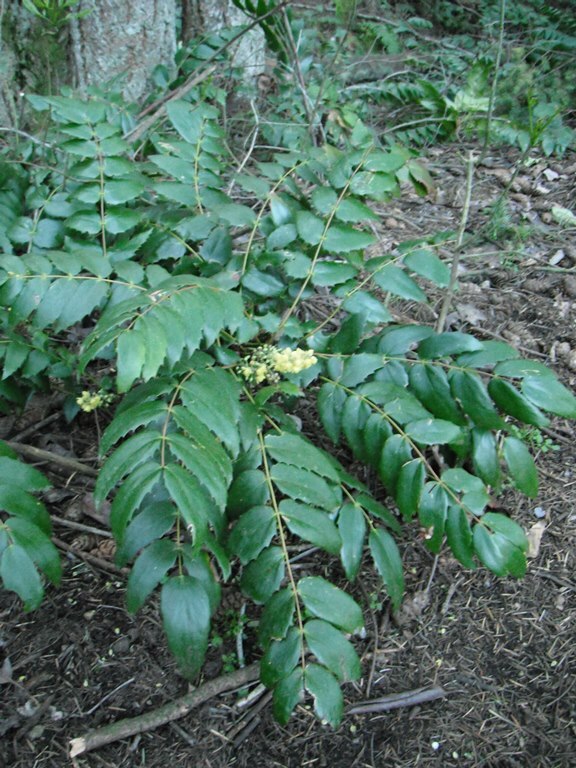 Mahonia is named after American Horticulturist, Bernard McMahon. 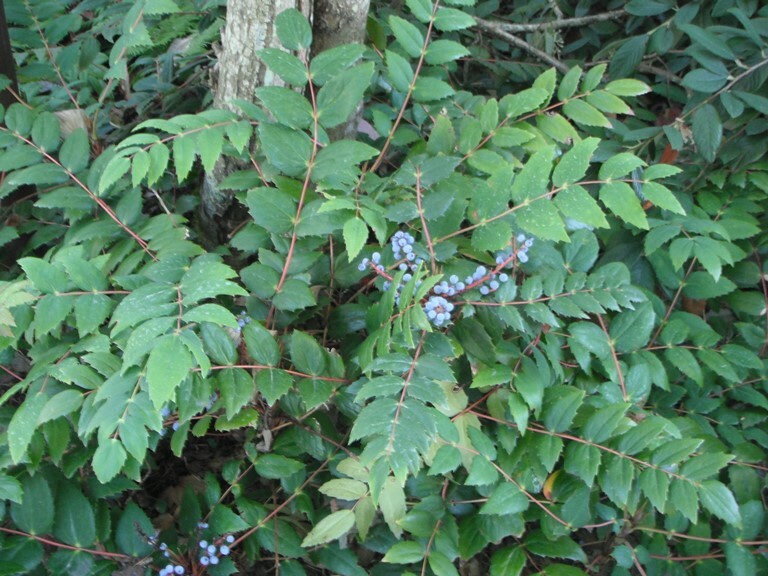 Horticulturists have consistently continued to use the genus Mahonia to refer to those species with compound leaves that give them a very different appearance from barberries. Relationships: There are about seventy species of Mahonia in Asia, and Central and North America, about 13 in North America. Some cultivated varieties have been developed. Low Oregon Grape, Mahonia nervosa, is another common Oregon Grape in our region. Creeping Oregon Grape, Mahonia repens, is chiefly an east of the Cascades species. Mahonias easily hybridize; intermediate forms often appear. Distribution: Tall Oregon Grape is native along the Pacific Coast from southern British Columbia to Northern California. Its range stretches across eastern Washington to the Idaho panhandle and Western Montana. 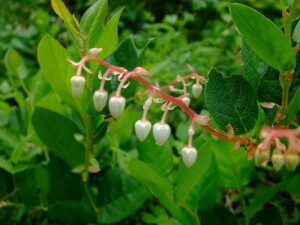 It also has been found growing in the Eastern United States, mostly in the Great Lakes Region. Having long been valued as an ornamental shrub, it may have been introduced to some of those other areas. Growth: Tall Oregon Grape grows to about 6-8 feet (2-2.5m) tall and spreads by underground stems to about 5 feet (1.5m) wide. It may grow slowly at first as it becomes established, then will quickly grow to its mature size. 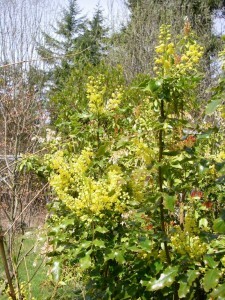 Habitat: Tall Oregon Grape is usually found on somewhat dry, rocky, open sites. It is often found along roadsides; in fact it is a preferred native for new plantings along major highways. 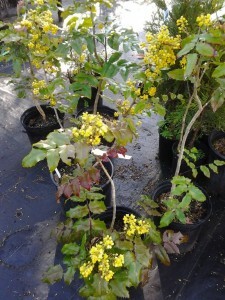 Tall Oregon Grape has 5-9 shiny leaflets per leaf. 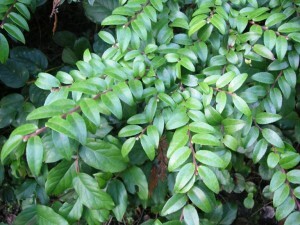 Diagnostic Characters: All Mahonias have compound leaves. Tall Oregon Grape has 5-9 leaflets per leaf with one central vein per leaflet. The leaves are generally shinier that those of Low or Creeping Oregon Grape. 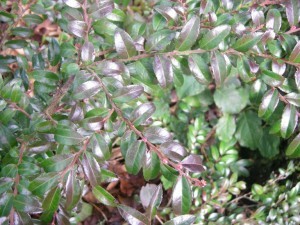 New growth in the spring is usually a bronzy red. 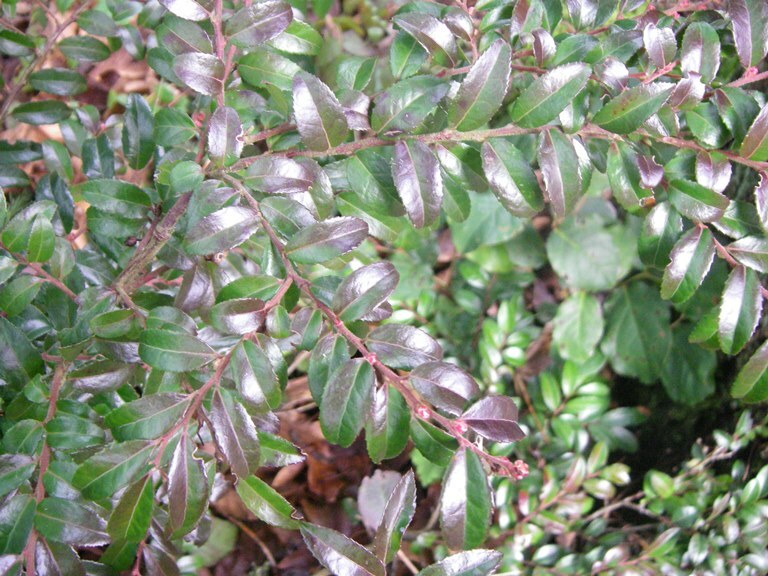 Cold weather in the winter often causes leaves to turn purplish or bronze. Yellow flowers are borne in erect terminal clusters. Dark blue, grape-like berries are about 1 cm across with a silvery bloom. 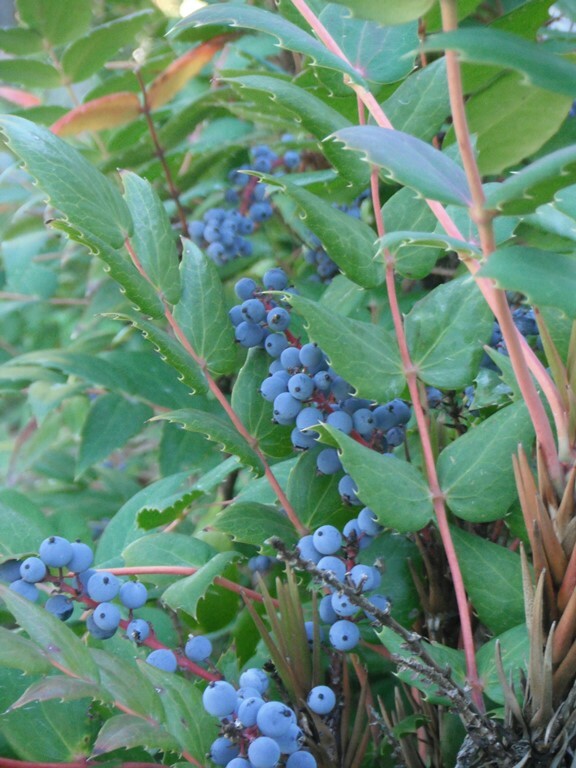 In the Landscape: Tall Oregon Grape has long been recognized as an outstanding landscaping choice. It can be used as an accent plant or as a screen. Its bronzy foliage, bright yellow, lightly scented flowers and bold texture can make an attractive addition to any landscape, but because of its prickly nature it should not be planted along walkways, where people may inadvertently brush up against it. Old or disfigured stems can be pruned all the way to the ground. Phenology: Bloom Period: April-May. Fruits ripen September-October. Propagation: Seeds should be stratified for 90 days at 40º*F. (4ºC) or planted outside as soon as they are ripe– seeds should not be allowed to dry out. 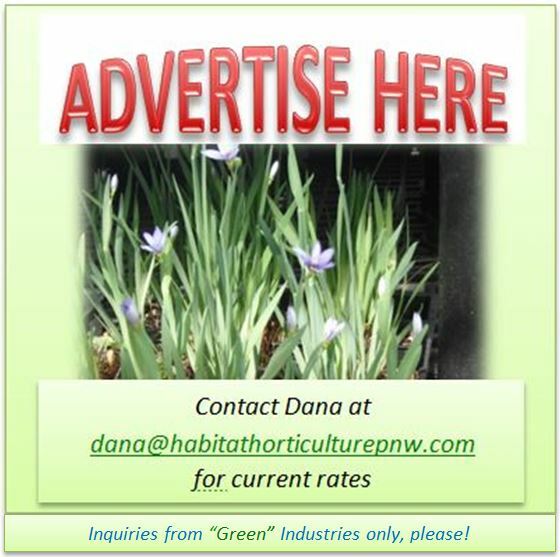 Cuttings should be taken in late fall and treated with hormone. Suckers from large plants may also be replanted. Oregon Grape berries make great jelly! 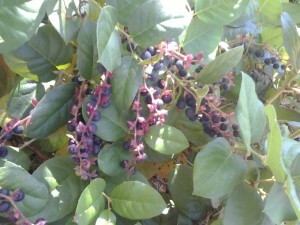 Use by people: Some natives ate the sour berries fresh. The juice has a lot of natural pectin and is great made into jelly or wine, by itself or in combination with other berries such as Salal. 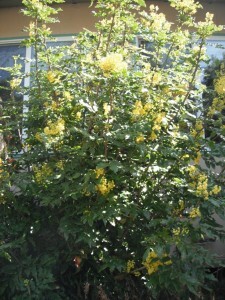 The roots of all Mahonias are bright yellow and were often used for making dye, especially for baskets. 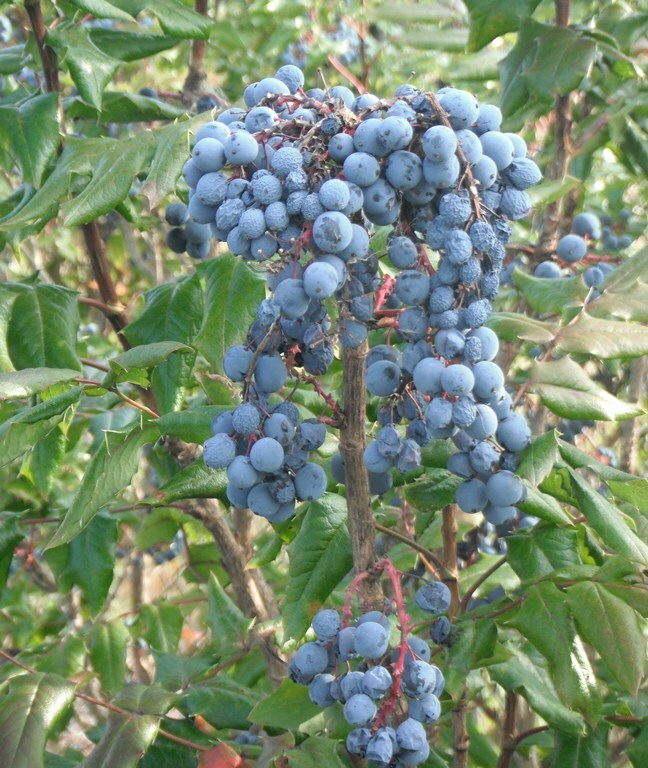 Use by wildlife: Birds eat the berries of Oregon Grape. The foliage provides cover for many species and browse for deer. The flowers are very attractive to insect pollinators and hummingbirds. 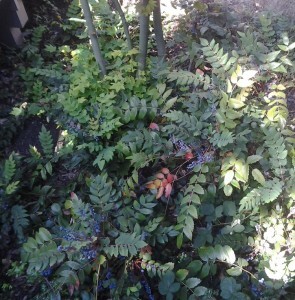 Creeping Oregon Grape or Creeping Mahonia is another valuable landscape shrub/groundcover. 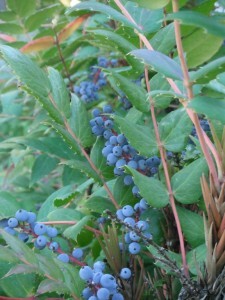 Some consider it a variety of Tall Oregon Grape. It does hybridize easily and intermediate forms can be found. 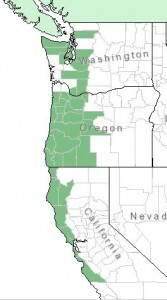 It is native to much of the western United States, but grows mostly east of the Cascades from Central BC southward, only reaching the coast in southern Oregon and northern California. It is a good as a groundcover that grows only 1 to 2 ft. (30-60cm) tall, spreading by underground rhizomes; in full sun or partial shade. This entry was posted in Evergreen Shrubs on June 24, 2015 by habitatdana.